Ofelia was born in our cattery out of Marion and Akela. We have one sweet litter from her and now she is neuter and live at other lovely home. 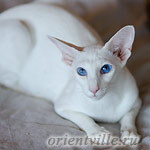 Ofelia has perfect body and very beautyful almond-shaped light blue eyes.